The Combat Medical Badge is awarded with the same requirements as that for the Combat Infantryman Badge. Medics are a special breed of people. More often than not they preform their duites of providing medical care to their troopers while being shot at and many times while being wounded themselves. A combat Medic is a True Hero in every sense of the word. I dedicate this section to the two medics that served with me in V ietnam. Bennie Baker and Percy Hipple. 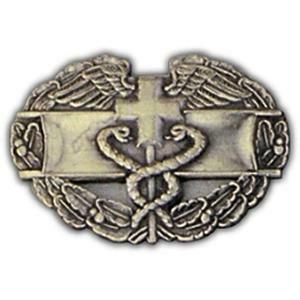 (1) The CMB may be awarded to members of the Army Medical Department (Colonels and below), the Naval Medical Department (Captains and below), the Air Force Medical Service (Colonels and below), assigned or attached by appropriate orders to an infantry unit of brigade, regimental, or smaller size, or to a medical unit of company or smaller size, organic to an infantry unit of brigade or smaller size, during any period the infantry unit is engaged in actual ground combat on or after 6 December 1941. Battle participation credit alone is not sufficient; the infantry unit must have been in contact with the enemy. (2) Award of the CMB will not be made to general or flag officers. (1) Effective 19 December 1989–Special Forces personnel possessing military occupational specialty (MOS) 18D (Special Operations Medical Sergeant) who satisfactorily perform medical duties while assigned or attached to a Special Forces unit during any period the unit is engaged in active ground combat, provided they are personally present and under fire. Retroactive awards under these criteria are not authorized prior to 19 December 1989. (2) Effective 16 January 1991–Medical personnel outlined in a (1), above, assigned or attached to armor and ground cavalry units of brigade or smaller size, who satisfactorily perform medical duties while the unit is engaged in actual ground combat, provided they are personally present and under fire. Retroactive awards under these criteria are not authorized prior to 16 January 1991. (3) Effective 11 September 2001–Medical personnel outlined in a (1) and b(2), above, assigned or attached to or under operational control of any ground Combat Arms units (not to include members assigned or attached to Aviation units) of brigade or smaller size, who satisfactorily perform medical duties while the unit is engaged in actual ground combat, provided they are personally present and under fire. Retroactive awards under these criteria are not authorized prior to 11 September 2001. (a) Medical personnel assigned or attached to or under operational control of any ground Combat Arms units (not to include members assigned or attached to Aviation units) of brigade or smaller size, who satisfactorily perform medical duties while the unit is engaged in active ground combat, provided they are personally present and under fire. Retroactive awards under these criteria are not authorized for service prior to 18 September 2001. (b) Effective 3 June 2005, Soldiers possessing a MOS of 18D are no longer eligible for award of the CMB (see para 8–6b(5)(c) above). (1) World War II (7 December 1941 to 3 September 1945). (2) The Korean War (27 June 1950 to 27 July 1953). (3) Republic of Vietnam Conflict (2 March 1961 to 28 March 1973), combined with qualifying service in Laos (19 April 1961 to 6 October 1962). (4) Dominican Republic (28 April 1965 to 1 September 1966). (5) Korea on the DMZ (4 January 1969 to 31 March 1994). (6) El Salvador (1 January 1981 to 1 February 1992). (7) Grenada (23 October to 21 November 1983). (8) Joint Security Area, Panmunjom, Korea (23 November 1984). 7) Grenada (23 October to 21 November 1983). (9) Panama (20 December 1989 to 31 January 1990). (10) Southwest Asia Conflict (17 January to 11 April 1991). (11) Somalia (5 June 1992 to 31 March 1994). (12) Afghanistan (Operation Enduring Freedom, 5 December 2001 to a date to be determined). (13) Iraq (Operation Iraqi Freedom, 19 March 2003 to a date to be determined). (a) Subsequent to 1 March 1961, a Soldier must have been assigned to a Vietnamese unit engaged in actual ground combat or as a member of a U.S. Army infantry unit of brigade or smaller size, including Special Forces Detachments, serving with a Republic of Vietnam unit engaged in actual ground combat. The Republic of Vietnam unit must have been of regimental size or smaller and either an infantry, ranger, infantry-type unit of the civil guard, infantry-type unit of the self-defense corps, or of the irregular forces. The Soldier must have been personally present and under hostile fire while assigned as specified. (b) Subsequent to 24 May 1965, Soldiers serving in U.S. units must meet the requirements of a, above. Soldiers who performed liaison duties with the Royal Thai Army or the Army of the Republic of Korea combat units in Vietnam are eligible for award of the badge provided they meet all other requirements. (a) Assigned as member of a White Star Mobile Training Team while the team was attached to or working with a unit of regimental (groupment mobile) or smaller size of Forces Armee du Royaume (FAR), or with irregular-type forces of regimental or smaller size. (b) A member of MAAG, Laos assigned as an advisor to a region or zone of FAR, or while serving with irregular type forces of regimental or smaller size. (c) Personally under hostile fire while assigned as specified in (a) or (b), above. (3) For service in Korea on the demilitarized zone. The special requirements for award of the CMB for service in the Republic of Korea are rescinded. Army veterans and service members who served in Korea on or after 28 July 1953 and meet the criteria for award of the CMB 8–7c, may submit an application (to include supporting documentation) for award of the CMB to the USAHRC, AHRC–PDO–PA, 200 Stovall Street, Alexandria, VA 22332–0471. Retroactive awards under these criteria re not authorized for service prior to 29 July 1953. Panama; Southwest Asia Conflict; and Somalia, regardless of whether a Soldier has served one or multiple tours in any or all of these areas. The Republic of Vietnam Conflict Era officially terminated on 10 March 1995. (4) War on Terrorism (Afghanistan, Operation ENDURING FREEDOM) and (Iraq, Operation IRAQI FREEDOM). f. Subsequent awards of the CMB is not authorized for the same qualifying period, as outlined above. g. The award approval authority for the CMB is the same as the CIB (see paragraph 8–6f above). (b) Of all Soldiers, it was recognized that the infantryman continuously operated under the worst conditions and performed a mission that was not assigned to any other Soldier or unit. (d) General Marwill’s well known affinity for the ground forces Soldier and, in particular, the infantryman. All these factors led to the establishment of the CIB, an award that would provide special recognition of the unique role of the Army infantryman, the only Soldier whose daily mission is to close with and destroy the enemy and to seize and hold terrain. The badge was intended as an inducement for individuals to join the infantry while serving as a morale booster for infantrymen serving in every theater. (2) In developing the CIB, the War Department did not dismiss out of hand or ignore the contributions of other branches. Their vital contributions to the overall war effort were certainly noted, but it was decided that other awards and decorations were sufficient to recognize their contributions. From the beginning, Army leaders have taken care to retain the badge for the unique purpose for which it was established and to prevent the adoption of any other badge which would lower its prestige. At the close of World War II, our largest war in which the armor and artillery played key roles in the ground campaigns, a review was conducted of the CIB criteria with consideration being given to creating either additional badges or authorizing the badge to cavalry and armor units. The review noted that any change in policy would detract from the prestige of the badge. (4) In 1948, the regulation governing badges stipulated that “battle participation credit is not sufficient; the unit must have been in contact with the enemy.” This clearly indicated that an exchange of hostile fire or equivalent personal exposure was the intent of the Army leadership. (5) In 1963 and 1965 HQDA messages to the senior Army commander in the Southeast Asia theater of operations authorized award of the CIB to otherwise qualified personnel “provided they are personally present and under fire.” U.S. Army Vietnam regulations went so far as to require documentation of the type and intensity of enemy fire encountered by the Soldier. The intended requirement to be “personally present and under fire” has not changed.